I was riding with a woman called Ange recently who is a very new convert to road cycling. She confided that when she gets on her trusty road bike she changes from an introvert who usually shuns social interaction, to a woman who wants to chat with anyone else on a bike. She deliberately speeds up when she sees other groups of cyclists so she can have a chat. Evidence indeed of the magic powers. There is plenty of stuff written about the benefits of cycling to assist with mental health issues. I believe it goes beyond those good endorphins you get from exercise. You can also get those from jogging or other forms of exercise. Cycling has another special element – a sense of freedom. The late Robin Williams said in an interview a few years back “My favorite thing to do is ride a bicycle. I ride road bikes. And for me, it’s mobile meditation.” And while you could argue that the magic wasn’t there for poor Robin, I think that it probably sustained him for many years until he finally succumbed to that awful sickness depression. And I love this post from fellow blogger Donna Navarro where she details how her bike helped her crawl out of a very dark place. I found this little gem on another website called Oopsmark.com and thought it summed up the energising effects of cycling. The feminist in me also loves the role that bicycles played in the gaining of women’s rights. One hundred years ago, Alice Hawkins, a suffragette, cycled around Leicester in England promoting the women’s rights movement, causing outrage by being one of the first ladies to wear pantaloons in the city. 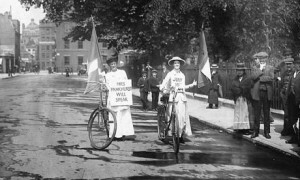 During the fight to win the vote the bicycle became not only a tool but also a symbol for the emancipation of women. I’m grateful to those women and many like them. Because of their campaigning I can vote and work, and have other equal footing, but I’m most grateful that I can ride a bike whenever I want, wherever I want, and wearing whatever I choose. Magic stuff. So there you have it, my evidence for the magical powers of the bike. Now you’ve got no more excuses. Get out and enjoy the beautiful Spring weather (that only applies if you live in the southern hemisphere like me).